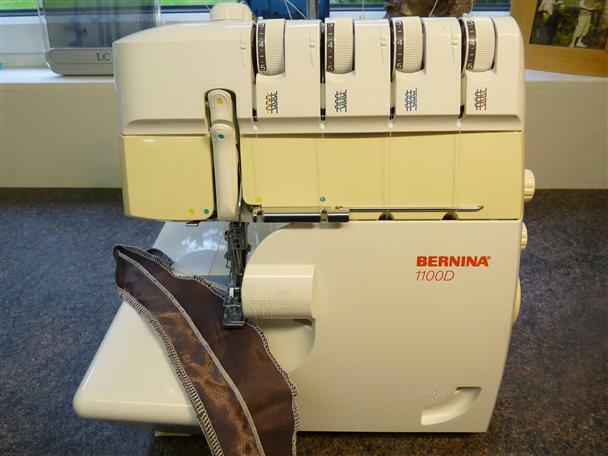 Bernina 1100d overlocker. Full sized well engineered machine with very easy to use controls. This overlocker is made by the Rolls Royce of the sewing world and sews like a dream. All 4, 3 and 2 thread overlock stitches are easily selected as is the built-in roll hemmer. threading is simple with lay-in tensions, a quick looper threader and the unique bernina swing out presser foot. This popular overlocker has fully variable differential feed for high quality seams, 2 step presser foot lift and electronic foot control. . This machine has hade a full service by me a Bernina trained mechanic a sewing sample can be seen on this machine, please note this machine has a small crack on the balance wheel this dose not affect the workings of this machine.